Not often one can host a mother and daughter team. I am very honoured to have Terri Talley Venters and her lovely mother, Leslie Talley as my guest bloggers. Both have new releases out with Wild Child Publishing. I will hand you over to Terri first, and then Leslie, to let them tell you all about their books and future plans. Wow! Where do I start? 18 years ago, my mother and I only dreamed of writing a novel, let alone getting it published. Our dreams of becoming mother/daughter published authors was just something we fantasized about. Now we’ve both published not only our debut novels, but their sequels as well. Reflecting back over the last 18 years, I realize how much hard work went into our first books: Make Old Bones for my mother and Carbon Copy for me. The hardest part for me was starting. I thought about it for 8 years before I finally started writing. The next hardest part for me was finishing. I spent 5 years writing Carbon Copy. My mother was the reason I started and finished it. I always tried to have a chapter for her to read whenever we planned a visit. Then the next hardest part about the writing process was the waiting. Although I was blessed to find a publisher within six months of finishing Carbon Copy, it was another 2 and half years in editing before it was finally released in June 2012. Now that we both have the same awesome publisher, Wild Child Publishing, the writing and editing are much easier for the both of us. I’ve recently finished writing my fifth book, Silver Lining, the epic conclusion to the Carbon Copy trilogy, while my mother is almost finished writing the fourth book in her bone series - The Bonnie, Bonnie Bone. My mother and I are case in point that hard work, patience, and determination, can make your dreams come true. We couldn’t have done it without each other’s constant encouragement all of these years. So now that we’ve had our dream of being mother/ daughter published authors come true, what’s our next dream? I still dream big. I’m looking forward to having both of our books out in print so that we can do book signings together. And although I loathe public speaking, I can’t wait to do a mother/daughter presentation at a writer’s conference. Thank goodness my mother is an award winning Toastmaster. I’ll just smile, nod, and show cleavage. We’re brainstorming a co-authored book which is a prequel to Carbon Copy and Make Old Bones. The characters in our books are related. My heroine, Lilly, is the niece of my mother’s heroine, Clarice. The title will contain both a “bone” and an “element”. My biggest dream of all is to have one of my books get made into a movie. My mother and I promised to be each other’s “plus one” if either of our book movies get nominated for an academy award for best adapted screenplay. And yes, I’ve mentally started writing my acceptance speech. Who knows what the future holds for our books, but the best part of all is that I’m enjoying this wonderful journey with my mother. I love you, Mom! Terri has two other published works available from Wild Child Publishing. 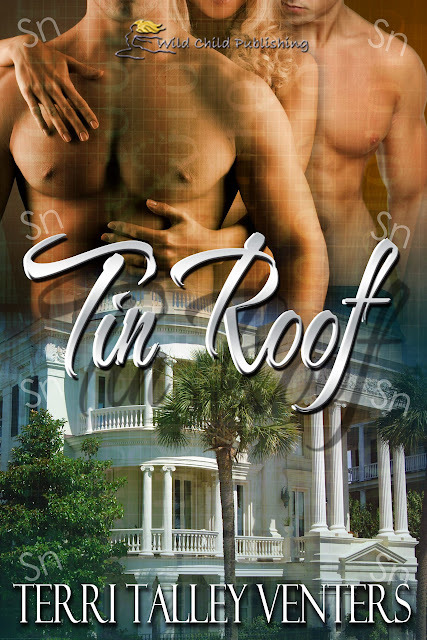 Carbon Copy and its sequel, Tin Roof, plus her unrelated novella, Copper Cauldron. She recently finished writing Silver Lining, the epic conclusion to the Carbon Copy trilogy, coming soon from Wild Child Publishing. Her romantic/suspense novel, Body Of Gold, is coming soon from Freya’s Bower. Terri also posts free short stories on her website each month. www.ElementsOfMystery.com. Follow her as she weaves her way through the Periodic Table of Elements. For the purchase links and more info about Terri’s books, visit her website. My daughter Terri’s interest in writing was sparked by a writers’ conference we attended in Melbourne, Florida, when she was in high school. Years elapsed during which time she mulled over an idea for a series which became Elements of Mystery. Meanwhile, I had published travel pieces and a few short stories, but the publication of my mystery novel, Make Old Bones, eluded me. It had won first place in the mystery/suspense category at the Space Coast Writer’s Guild in 2000. Finally in 2008 Terri and I attended a conference sponsored by the North Florida Writers’ Association at Ponte Vedra Beach, Florida. Make Old Bones once again won first place in the Lighthouse Book Awards for mystery/suspense. Terri was so proud, she cried! That spurred me on; that spurred her on. She finished writing her mystery novel, Carbon Copy. She hoped to ride in on my coattails. The opposite happened. One way I may have unconsciously influenced her is by setting, or a sense of place. According to my professor, Dr. Richard Adicks from Literature of the South at the University of Central Florida, there are six prominent features in Southern writing: a sense of history or of the past; a sense of religion or original sin; a sense of the grotesque; a sense of place; a sense of family or genealogy; and agrarian, or rural. I write from a sense of place. Set your novel in a unique setting, and all manner of ideas pop up. Terri imbibed this from somewhere. Her first novel is set in New York and the Florida Keys, the sequel in Charleston. Her upcoming takes place in Scotland. My first takes place in Daytona Beach, the second in St. Augustine, the third in Ireland, and my work-in-progress in Scotland. We both have hurricanes and castles figuring prominently. Even though we are much alike we have differences. My degrees are in English with some nursing thrown in. Hers are in Accounting and Taxation. She comes up with better plots. And while my mysteries are Cozies, hers are more modern. But the acorn doesn’t fall far from the tree, to be trite! Great minds, and all that! 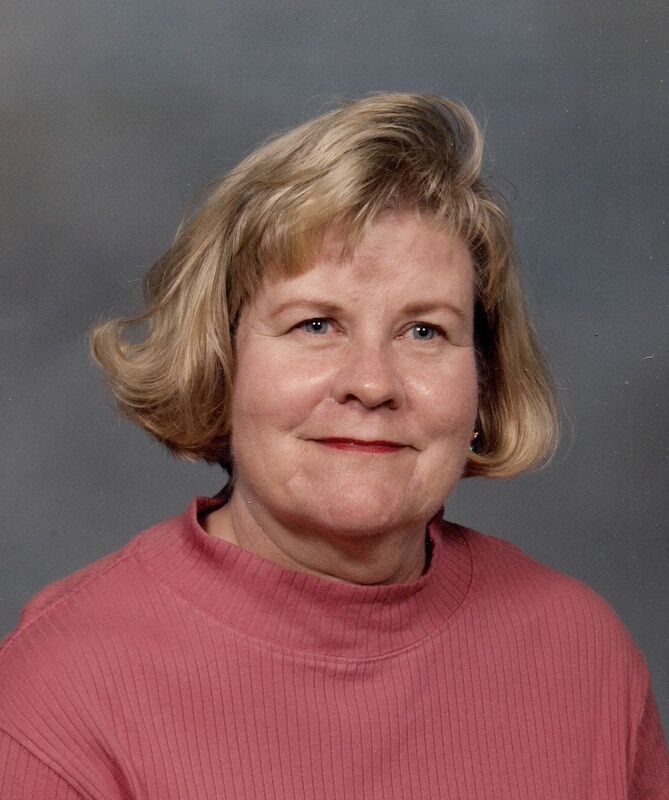 Leslie Talley received her B.S. in Nursing from the University of Kentucky and a B.A. and M.A. in English from the University of Central Florida, Orlando, where she subsequently taught, as an adjunct, Technical Writing and Business Writing for ten years. Leslie and her husband Luke have two children: Terri Talley Venters, Wild Child author of Carbon Copy, Tin Roof, and Copper Cauldron; and Damon Talley, video conference lead at Harris Corporation. Leslie and Luke have lived in Titusville, Florida, for forty-five years. 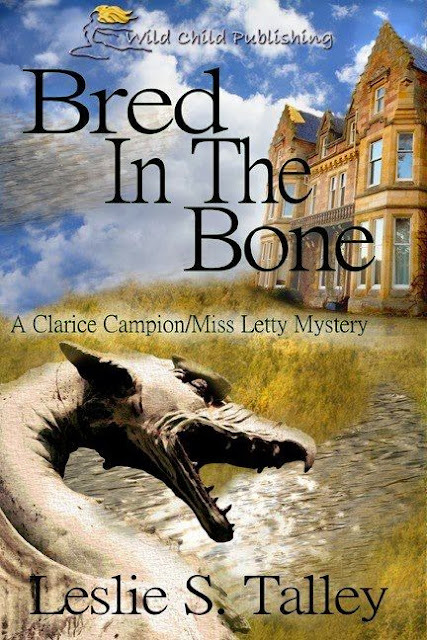 Make Old Bones and Bred In The Bone are both available from Wild Child Publishing, amazon.com, and barnesandnoble.com. Purchase links can be found on her website. Thank you so much for hositng us today! This has been a wonderful journey. and even better, I get to enjoy it with my mommy! You're welcome, Terri. Yes, you are very lucky to experience something like this. All the best to both of you.